Calcaneal fractures are not unusual. 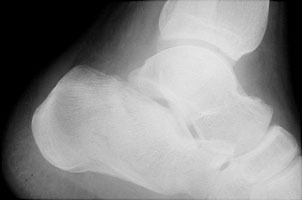 A "lover's" fracture is a common calcaneal fracture, resulting from an axial load type of injury (falling). Radiographically, there is a decrease in Boehler's angle to less than 20 %. Moreover, 75 % of these fractures involve the subtalar joint and 10 % are bilateral. Associated fractures with the same axial load mechanism include burst fractures of the spine ("Don Juan" fracture) and pilon fractures of the distal tibia. A Harris radiograph. There is a comminuted fracture of the calcaneus. 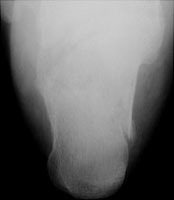 B Lateral radiograph of the ankle. This shows flattening of Boehler's angle and sclerosis through the calcaneus. C Axial CT. 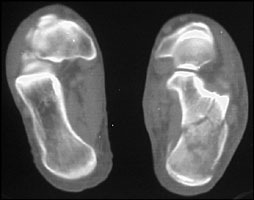 This image of both feet shows a calcaneal fracture. The normal size is included for comparison. D Axial CT. This image better demonstrates the comminuted calcaneal fracture. 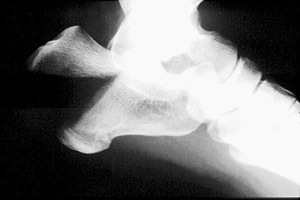 E Lateral radiograph of the ankle. There is a hatchet injury to the calcaneus. F Axial CT. 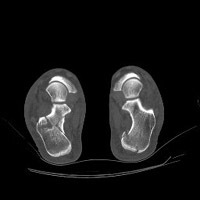 This image demonstrates bilateral calcaneal fractures, due to a fall.